Born in Poland, Loggan was appointed engraver to Oxford University in 1669. He produced some of the earliest and best known Oxford views. He published a book with engravings of all of the colleges in 1675 and became a British citizen in the same year. 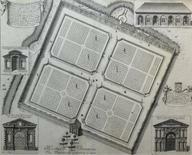 Made engraver to Cambridge University in 1690.